Agree with this. He's definitely a plus to Mayo when he's fit and available. They've a couple of other options now though. It has been a good league for them even leaving aside winning it. He is a prolific scorer but I don't think that makes him a top level forward. The style of play and the type of running power Mayo have means that they will generate a lot of handy frees which O'Connor gets his name put towards, the way Mayo attack means that they also get plenty of men over on their attacks from their running power from deep and I think O'Connor benefits hugely from playing in that Mayo side rather than the other way around. McAliskey finished the season as the joint 2nd top scorer in Championship and joint 2nd top scorer from play in Championship last year, he didn't even get an All Star nomination. I think O'Connor is a decent player but he's not a top level attacker, I wouldn't have him in the top 10 inside forwards in the game at any stage over his career. 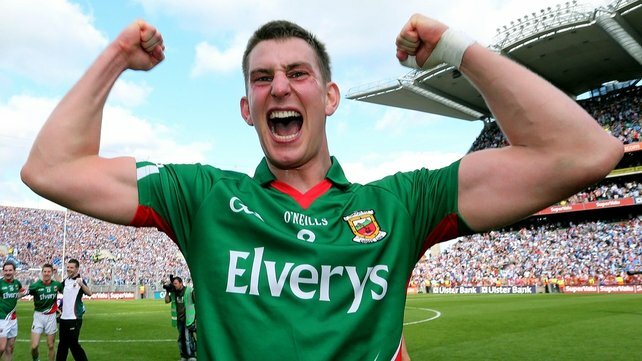 In the current Mayo side I would have him behind the likes of Keegan, Durcan, Boyle, O'Shea, Parsons, Barrett, Clarke, Doherty, McLoughlin, Moran and DOC in terms of his importance to Mayo from open play over the past number of years. He is a good free taker, he puts in a shift, he will take scoring responsibility when his team needs it, he is a good finisher - they are his strong points. However, he is pretty easily marked out of a game, he doesn't have much pace, he's not the most physical for a big guy and doesn't win an awful lot in the air, he doesn't have much of a left foot, his movement is not the best, he doesn't really have that flair or craft. If you gave a man marker the strict detail to stay on O'Connor and nullify him, it's pretty easy done - however when you play Mayo it's more than likely you're going to have to leave that post when the runners like Keegan, Durcan, O'Shea, DOC come through with big danger mounting. He's a decent player but he's not a top level attacker and there is no convincing me he is despite his scoring statistics. Thing is though he might provide something Mayo badly need (a finisher and reliable freetaker) so it doesn't really matter what level of overall player he is. If he improves the team he'll be in. I'd rate him similarly as yourself and one or two others do as an individual player but I really think he's hugely important to Mayo because he does things none of their other forwards do. With the possession they'll typically have he'll have plenty of opportunities. Paul Conroy, who sustained breaks in both legs in a collision during last year's opening 'Super 8s' game against Kerry, continues to rehabilitate but it will be well into the summer when he makes a full return. "He's not in contact yet. The next few weeks will determine how he comes forward when he goes into contact," Walsh said. That doesn't sound very hopeful at all. Still in a walking boot. Walsh said he hopes to have him back end of May. Not sure he'll have much of an impact on the Connacht championship though. Maybe the Super 8's if they get that far. Think it's taken so long as they thought he didn't need surgery at first. Then once it wasn't healing they eventually had to have the surgery done. Doesn't reflect well on the medical team, he'd be back by now if he'd had the op in the first place. Cummins is a decent enough replacement, for a small fella he gets more than his fair share of fisted goals. Speaking of that, whats Comer at these days? Must have done serious damage to miss the entire league with an ankle injury sustained at Christmas. Wasn't Cummins Galways top scorer from play in the league . Mainly due to goal .though some of the genius's here would hold that against him Following the the analysis of Co'C. You're being overly sensitive again. COC gets the most out of himself but the criticisms are valid and I wouldn't have him as a top level forward. I simply don't think he contributes enough from play. The type of players Mayo have and the type of game they play means they generate a huge amount of handy frees in every game, O'Connor is one of the best free takers in the game too - I would estimate that at least 50% of his entire scoring total comes from placed balls inside 30 metres. He can finish, he can take on the shooting responsibility, he can put a good defensive shift in from the front and he is a very reliable free taker. But his limitations are obvious, he doesn't have that craft or flair, the aerial ability to win ball despite being a big man, the movement to lose a marker when being tightly watched, the ability to kick scores of his weaker foot consistently, he lacks pace and having watched him live at matches I don't think he shows enough for the ball from open play. I don't think anybody is saying he is useless or poor, people are saying that he's not a top level forward from open play which is a more than fair comment.